A group of Longmont middle school students successfully sent a scientific balloon carrying edible treats into the sky last Saturday as an atmospheric physics experiment. Guided by LASP scientists and education/outreach staff, the Trail Ridge Middle School eighth grade Earth Explorers class launched a balloon platform carrying a container of Jell-O and a marshmallow into Earth’s atmosphere. The goal of the experiment was to test the effects of atmospheric pressure changes on the foods. 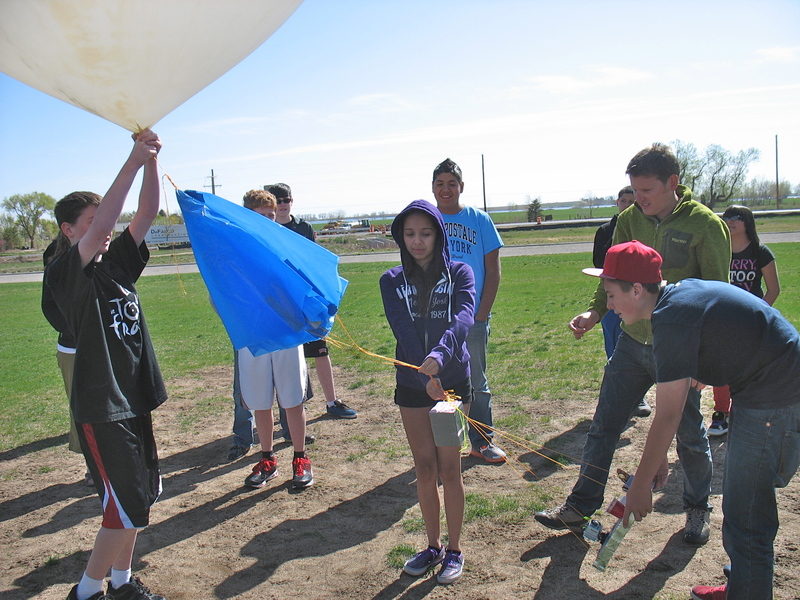 The students, scientists, and teachers launched the balloon from the middle school on Saturday, April 14, sending the experiment approximately 110,000 feet into Earth’s atmosphere before the balloon popped and landed in Cheyenne, Wyoming. Video footage from an attached camera showed the marshmallow expand and the Jell-O freeze because of decreases in atmospheric pressure and air temperature as the balloon ascended. Prior to launch, LASP scientists Lars Kalnajs and Pat Brown helped the students design the shape and size of the platform and attach it to the scientific balloon. They affixed a video camera, a marshmallow, a container of Jell-O, a thermometer, and a clay sculpture of the school’s grizzly bear mascot to the platform, using the camera’s field of view as a point of reference to monitor changes to the items. The students made predictions about how the food would change as the balloon rose and the atmospheric pressure decreased. LASP staff used the camera’s Global Positioning System (GPS) to retrieve the balloon in Cheyenne later that day. Now that all components have been safely collected—aside from the clay mascot, which broke off during descent—the students will use the footage to create a video about their experiences in the Earth Explorers program. The program trains youth in using new media technology to tell stories about science. For more information about this NASA-supported semester-long project, please see http://lasp.colorado.edu/home/education/k-12/additional-programming/.